Black and White and Loved All Over: Supper + Jessie Baylin's Song. Supper + Jessie Baylin's Song. If you're a close girlfriend of mine, you're probably like ... not again. 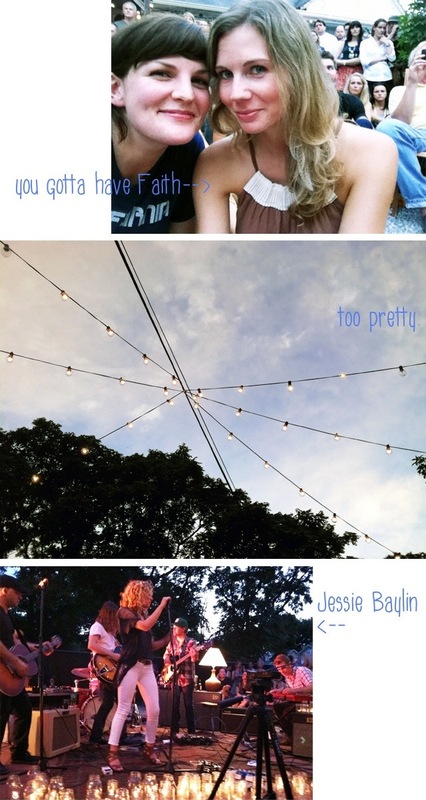 Because I really love Jessie Baylin, y'all. Again, if you're a close girlfriend of mine, you're probably like ... Dude, can we listen to something else pleeeeease? But I mean, just have a look-see at this. Isn't she so breathtaking and yet at the same time someone you'd want to drain a bottle (or two) of wine with and, like, talk about boys and clothes? And isn't her voice just ridiculously smoky? She doesn't play live a whole bunch, so it's special because she's always sortof nervous and you get to watch her unwind right before your eyes. I met her back in the day when I wrote this article about her for Gibson, and I've been hitting up her Nashville concerts ever since. Last night my gal Faith met me at Imogene + Willie's for their Supper and Song shindig, which feels like a private party with all of Nashville's pretty people. (Ahem, Karen Elson was on a blanket right beside us and The Black Keys's Dan Auerbach was just on the peripheral -- WHAT.) Plus, Yazoo was dishing out free beer and the Mas Tacos truck was on site. Word. It was a super great night under the Nashville stars. The baby? She was with Nekos. He's been adamant about me having more girls' nights because I've been aching for them. Good thinking, Nekos. Can't say I've heard of Jessie before but I'll have to check her out! I certainly have heard of your viewing neighbors though! Exciting! When will she have a new cd out?! btw, I think you and Nekos should rent a car when you go to Barcelona and go visit Tossa. Were there any kids there? My husband and I are trying to get out more, but we can't leave our kids anywhere. I've been wanting to go to this !